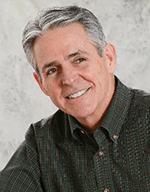 Bill Olsen is a nationally-ranked professional facilitator and trainer focused on delivering accelerated results through Creative Thinking and Creative Problem Solving. Whether facilitating offsites, training groups or presenting workshops, he has a reputation for delivering dynamic offsites, tangible outcomes and strong consensus. He integrates purpose, processes and participants into workshops that are creative and interactive, while also being practical. (Okay, they’re fun!) A frequent conference speaker, he has a passion for accelerating performance. Having supported clients in 20 countries and 31 US states, he serves those with a genuine need for meaningful change. As a US Navy Commander, Bill transitioned from service at sea, to managing Programs ashore. While leading a high-risk project in 1996 he trained in Creative Problem Solving. Applying creative facilitation as a manager, his project achieved unparalleled success and was awarded the Nation’s “Silver Hammer Award for Reinventing Government”. He began facilitating other high-risk Defense programs, accelerating other teams to early milestones and four more Silver Hammers. As a University professor he shared these Creative skills in original courses, which were formally recognized as “the most popular electives in the history of the University”. Corporations: P&G, Coca-Cola, Disney, Caterpillar, Nokia, Novartis, PWC, MITRE, CACI, multiple Banks & Credit Unions, Cisco Systems, GHD-US, CWCO, EMCOR & more. Government: EPA, DOT, DOE, NOAA, DHS, GSA, FDA, HHS, NIH, NASA, OMB, VA, Municipal Depts of Public Works, Chambers of Commerce & the government of Jamaica. Military: Major Programs in all services, incl. offices of Sec. of Defense, AF & Navy, incl. programs in Warfare Systems R&D, Medical, SBIR, Mine Countermeasures, Safety & IT. NFPOs: 60+ Global, National & Regional associations, non-profits & communities. Includes dozens of major Health care, Health research & Social Service associations. Facilitation of a wide variety of complex technical, programmatic and political issues. Lead facilitator of national-level Summits & conferences, incl. large facilitator teams. Lead facilitator of executive offsites, strategic Thinktanks and team-building retreats. Facilitator of Partnering projects involving multiple stakeholders & complex issues. Professionally Certified® in MBTI, KAI, NBI, WSP, CPS, EF, SP & 7 Levels of Change. Holds active US Defense Security Clearance & regularly supports classified programs. Lead trainer of LSI courses in Facilitation, Strategic Planning, Masterful Meetings, and his own courses in Change Management, Creative Thinking & Creative Problem Solving. Bill is a Certified Professional Facilitator® (CPF), and a regular keynote presenter in conferences focused on Facilitation and Creativity. He has served as Advisor or Member to Association Boards, and is consistently listed in the “Top 20 Facilitators” of the global FindaFacilitator.com database. Representing Leadership Strategies in Washington DC, Bill Olsen provides his services globally.